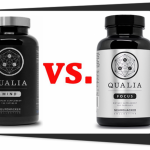 Qualia Mind vs. OptiMind presents a face off between two brain boosters for people who want to enhance focus, mental energy, and mental performance. Qualia Mind is an enhanced all-natural formula which provides advanced ingredient forms to enhance your mental abilities. On the other hand, OptiMind clears brain fog and enhances mental energy by providing essential nutrients and a proprietary blend for your brain. 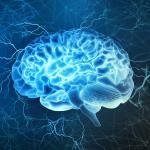 Is one nootropic stack better than the other? Let’s find out in this review. Vegetarian capsule (hydroxypropyl methylcellulose), Calcium Silicate, Magnesium Stearate, Silicon Dioxide, Titanium Dioxide (color). Qualia Mind and OptiMind are both best-selling brain formulas which aim to give you optimum mental performance. How are Qualia Mind and OptiMind formulas similar? Qualia Mind and OptiMind both offer the same absorbable form of Vitamin D (cholecalciferol). However, these nootropic stacks provide different dosages. Qualia Mind provides the recommended daily dosage of Vitamin D for adults (125 percent of the daily value), while OptiMind does not provide enough (385 IU), so you still need to obtain this vitamin form dietary sources. Taurine is a popular staple nootropic ingredient. There is no other available form for this ingredient. The good news: Qualia Mind and OptiMind both provide taurine. The bad news: OptiMind did not state its dosage for taurine. 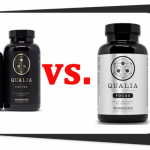 How are Qualia Mind and OptiMind formulas different? 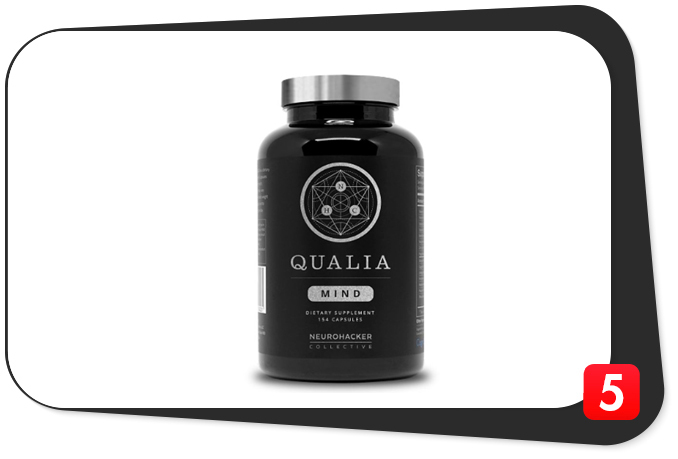 Qualia Mind provides better forms and dosages of its ingredients which bear resemblance to OptiMind’s. Moreover, there are obvious mistakes in the formula label of the latter. The manufacturer listed vitamin B12 as Pyridoxine HCl. In reality, this is a form of Vitamin B6. Customers shouldn’t ignore this mistake on the label since this is a so-called “smart supplement”. We expect nootropic supplement manufacturers to know better than this. Because of the company’s mistake, we don’t know whether OptiMind contains Vitamin B6 or B12. For its part, Qualia Mind did not make any mistakes on its label about the forms and dosages of its ingredients. 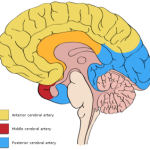 Qualia Mind and OptiMind both contain l-tyrosine. However, the former provides an advanced form and known quantity (n-acetyl-l-tyrosine, 250 milligrams). Qualia Mind provides better ingredient forms and known dosages. These two formulas have several ingredients in common. Despite their similarities, Qualia Mind delivers superior ingredient forms. On the other hand, OptiMind did not state the dosages of some of its ingredients.With that in mind, it is difficult to tell which formula provides the better dosages for some of these ingredients. Qualia Mind gives you more ingredients per serving than OptiMind. In addition, each ingredient of Qualia Mind has nootropic benefits which science backs up. On the other hand, OptiMind contains fewer nootropic ingredients which are less potent and with unknown dosages. In addition, the huge turn-off about OptiMind’s formula is its proprietary blend which hid the dosages of its most beneficial ingredients. This makes us question the overall potency of OptiMind. Why hide the dosages if the manufacturer claims they’re potent? The nutrient combination of Qualia Mind is better than OptiMind’s. In addition, the former contains a good selection of some of the best nootropic components. The ingredients of Qualia Mind also feature potent dosages – it did not have to hide the dosages of its ingredients in a proprietary blend. The manufacturer also provides each ingredient in superior forms. Therefore, Qualia Mind has the better formula between these two nootropic stacks. Clean Label No. Other ingredients include: Organic Rice Extract Blend, Organic Rice Concentrate, Vegetable Cellulose, Silicon Dioxide No. Other ingredients include: Vegetarian capsule (hydroxypropyl methylcellulose), Calcium Silicate, Magnesium Stearate, Silicon Dioxide, Titanium Dioxide (color). Advanced Delivery No. Plain vegetarian capsules. No. Plain vegetarian capsules. Stim-Free No, it contains Caffeine Anhydrous. No, it contains Caffeine. The formula of Qualia Mind is better than OptiMind’s because the former contains more ingredients of notable quality. In fact, Qualia Mind contains advanced ingredients of all kinds while OptiMind contains just two branded ingredients. 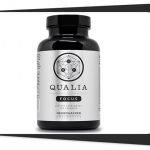 Qualia Mind also contains fewer supplement additives and comes in vegetarian capsule form. Both supplements contain stimulants – you might encounter jitters because of their caffeine content. However, the manufacturers of both of these formulas did not indicate any potential side effects. The implication: chances are, their stimulant content produces mild effects. These prices for Qualia Mind are from Amazon in 2018. If you want to shop around for a better deal and save a few dollars, you could also buy Qualia Mind from their official website (which you can check out here). You won’t find deals on Qualia Mind and OptiMind on GNC and Bodybuilding.com. On the other hand, you can only buy OptiMind from their official website (check it out here). Qualia Mind provides premium ingredients at a premium price point, no doubt about that. With that in mind you get what you pay for because of the variety of ingredients and hefty dosages it provides. In contrast, OptiMind might be a moderately-effective nootropic stack. Moreover, it has been involved in autoship scams and money-back guarantee refusals which gave OptiMind a bad reputation. In terms of pricing, OptiMind is cheaper than Qualia Mind. However, the few dollars’ worth of savings is not worth it if you experience autoship scams and money-back guarantee refusals with the former. It is always better to get a supplement from a reputable manufacturer with a good reputation. 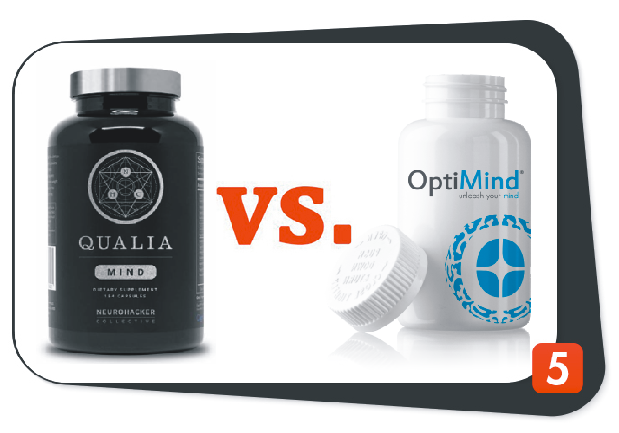 Qualia Mind vs. OptiMind: Which is Better? This is a no-brainer. While Qualia Mind is expensive because it is a premium supplement, its ingredient combination and dosages are top-notch. Plus, its variety of ingredients provides a good cognitive boost. The quality of the individual ingredients is superior to that of OptiMind. However, being a premium nootorpic supplement, you can’t expect Qualia Mind to come cheap. We conclude these nootropic stacks are not on the same level in terms of their potential effects. Qualia Mind provides better benefits than OptiMind. However, if you need a cheap supplement under the nootropic category, OptiMind might do the trick. Nevertheless, you can still check out better nootropic stacks within the similar price point.